This delicious strong pale ale is a genuine jewel in Yorkshire's brewing crown. It was first brewed in 1952 at Timothy Taylor's historic Knowle Spring Brewery in Keighley, where production has remained ever since. 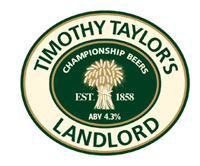 Landlord has garnered countless awards over the years and is rightly admired the world over for its highly distinctive, remarkably well-balanced flavour. Another cask beer with a long and proud Yorkshire heritage, which very sadly came to a controversial end in 2010 when the brand owners Carlsberg closed the historic Leeds brewery for good and transferred production of Tetley Cask to Banks's brewery in Wolverhampton. 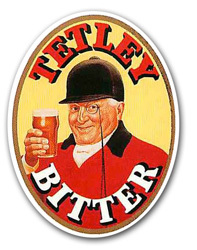 Fortunately the new version has retained much of the original's character, which meant it qualified to stay on our bar, in keeping with The Swan's Tetley heritage. A full-bodied roasted malt flavour with a hint of caramel, and a smooth hop character and bitterness derived from English hops. A refreshing , hoppy pale session ale brewed with Pale and Vienna malts, and a blend of Pioneer, Cascade and Polish Sybilla hops, brewed exclusively for The Swan by Treboom Brewery. Founded by John Lewis and Jane Blackman in 2012, Treboom is a thriving microbrewery located just a few miles up the A19 north-west of York, in the village of Shipton-by-Beningborough. 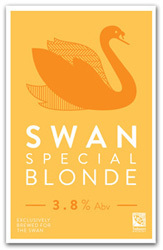 The first Special Blonde brew took place on 25th Nov 2014, and the beer was launched in the pub on 9th December since when it has remained a firm favourite with both regulars and visitors.